I used to wake up, stumble over to my phone, and immediately get lost in a stream of pointless notifications. This digital haze continued throughout the day, keeping me from accomplishing important tasks. I was distracted, anxious, and ineffective as a leader. I knew I had to change but could not seem to break free from the behaviors that kept me locked into the same cycle. This problem is not unusual. Executives across the world stumble through each day in much the same way. Two major challenges are destroying our ability to focus. 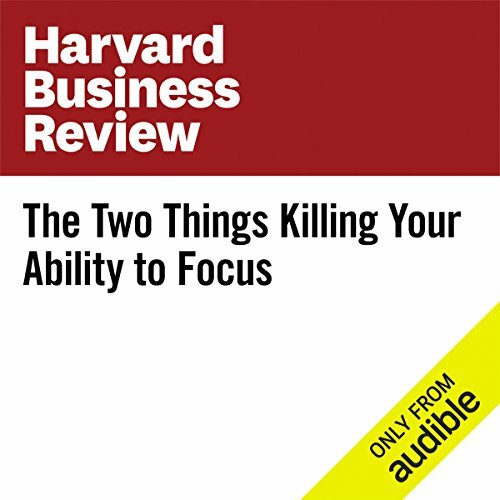 "The Two Things Killing Your Ability to Focus" is from hbr.org, published on August 3, 2016. Great advice in a super condensed narration. for example: don't get trapped by your email inbox, limit meeting participants to 8 or fewer. Require that meetings have takeaways in the form of action items. All in all a short list of indispensable principles to guide you through the day.